I fear my blog is seriously derailed. I'm supposed to be working myself through the remaining 2 designs in the Japanese coat book (a pea coat and a trench), but I found myself totally sucked into ETSY the other day. Here are the damages! This pattern was a ridiculous $3, and the size Medium is already cut out. It's from 1978. I really need to find some nice white shirting for this one. I'm sure it will be quite voluminous, so I'll need to make a muslin and figure out how to pare it down. I'll break out my My Fair Lady vinyl and pretend that I'm Henry Higgins. Of course the pipe totally sucked me into this one! 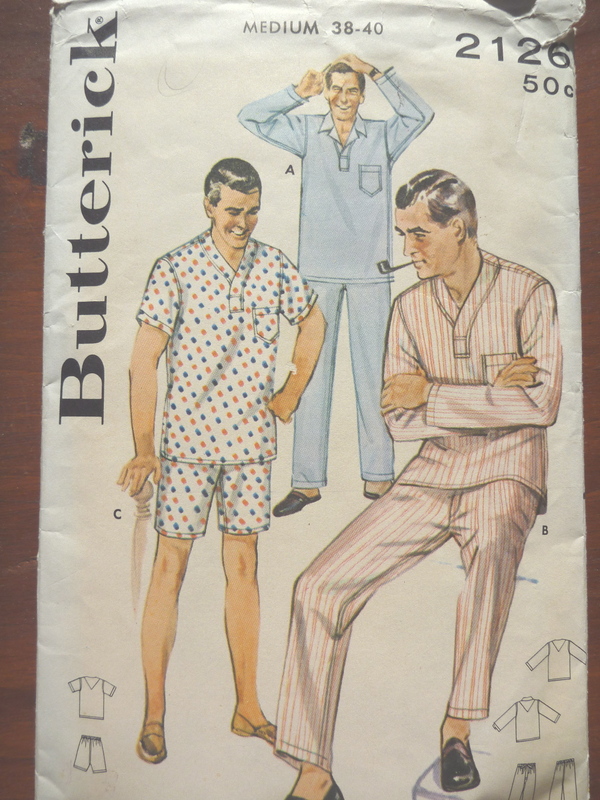 I really needed a pajama pattern and this was one of the more unique ones that I found. I'm intrigued by the collar / placket in version A. But, truth be told, I probably won't ever make it because I prefer to sleep in a t-shirt. 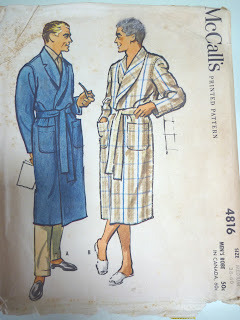 I'll definitely make the bottoms and a coordinating robe in flannel for the winter. Hey, what about the trench coat? 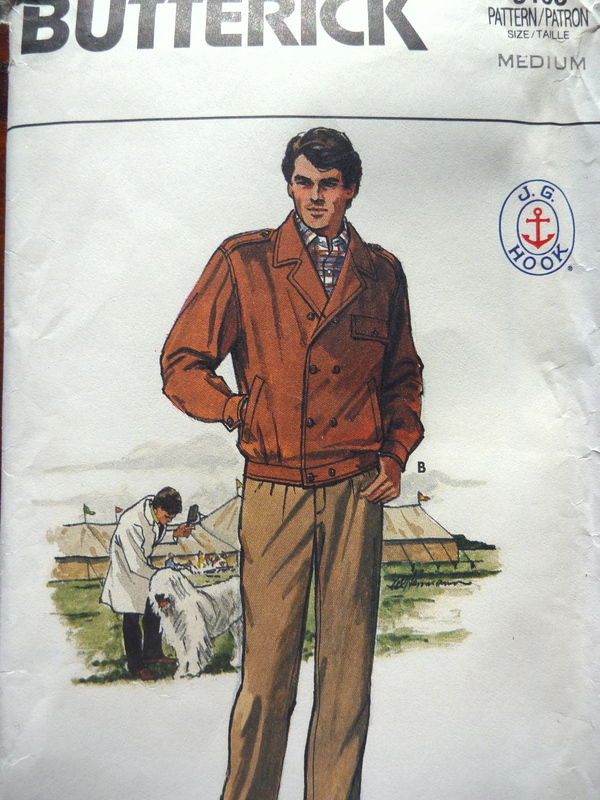 Oh boy, this was billed as a Member's Only jacket. That sure grabbed my attention. 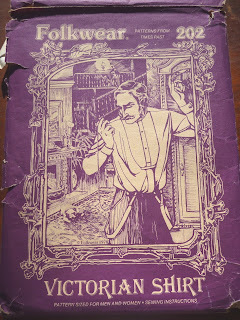 Actually, as you can see, it's by J G Hook and dates from 1985. I'm not sure if J G Hook still exists. My assumption is that they've been eclipsed / swallowed up by the likes of Polo and Hilfiger. I guess I'm old enough that this kind of fashion is very appealing to me. I'm just not 100% sold on the epaulettes. 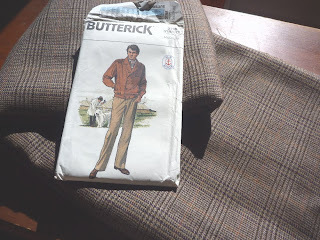 I have about 5 yards of this wool glen plaid. I used this as the contrasting collar on last year's purple fall coat. I think it will be perfect for this jacket. The next time I'm in NYC I'll be shopping for 15 buttons and a yummy lining for this. Hey, what happened to the pea coat? Lastly, is this faux Hudson Bay blanket from LL Bean. I'm toying with the idea of adapting the bathrobe pattern from my last project into an overcoat. I picture it fastened closed with a couple of huge bone toggles through big bound buttonholes. OMG I'm so off track here. Maybe I need a new title for my blog. 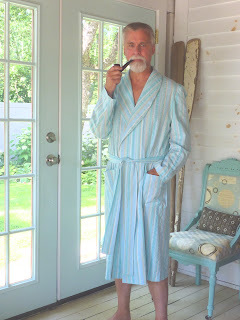 Here I am lounging on my porch in my new summer bathrobe. Yay! This version features the plain shawl collar. 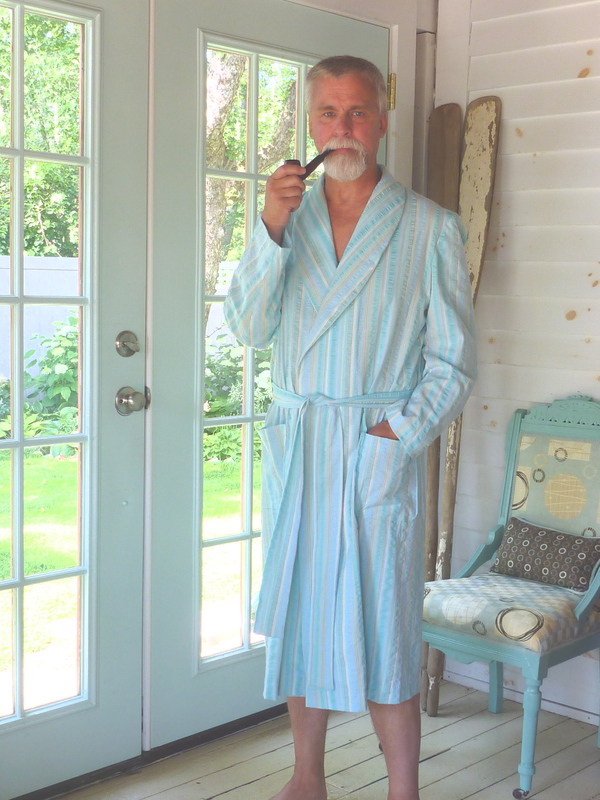 I shortened the length by 3" which allowed me to cut the robe out of 4 yards. It was a pretty tight fit with hardly any scrap left over. I did manage to match the stripes on the patch pockets. I think this shot shows the fabric's texture well. The color also coordinates very nicely with my porch furniture. Of course the look isn't complete without the pipe! Needless to say I'm totally in love with my new summer robes. This pattern was a joy to work with, right down to the font that was used on the pattern tissue. 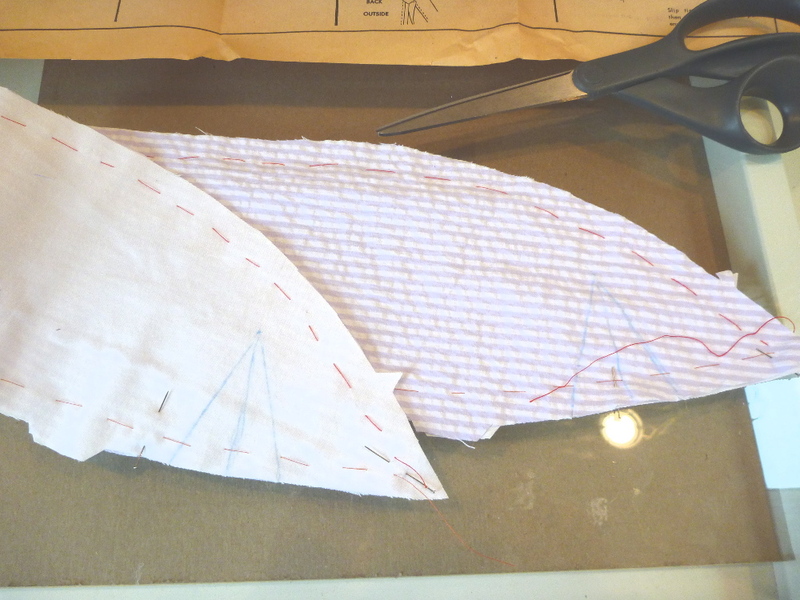 There was even a separate pattern piece for the front interfacing, how quaint. 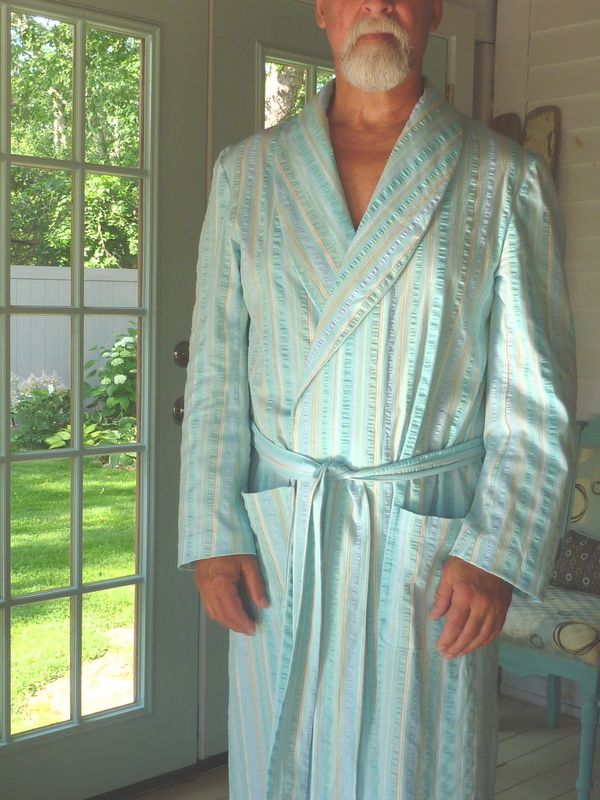 The robe also features a two piece sleeve, which is unheard of on any bathrobe that could be purchased today. In fact, with just a little tweaking this could easily be a winter coat. Hmmm. Maybe there's another project brewing. I've been in need of a new summer bathrobe for years. The one I have is disgusting. A gray and tan seersucker (how depressing), hopelessly stained from a self tanning experiment gone terribly wrong. 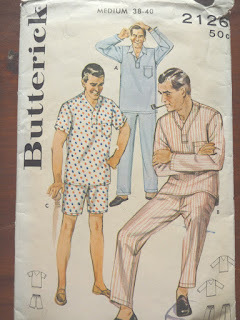 I found this great vintage pattern on Etsy. McCall's #4816 circa 1958 in size 38-40. I was totally sucked in by both the notched collar detail on the blue version and the pipe! I was lucky to be in NYC in early June and dropped by what has become my "go to store" in the garment district, H&M Fabrics on W. 35th St. They had bolt after bolt of cotton / lycra seersucker for a ridiculous $2 / yd. I picked up both a lavender and white stripe, and an aqua and multi color stripe. 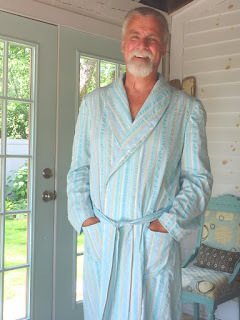 Throw in a spool of thread and you have a new bathrobe for about $10. I won't go into a lot of the construction details. 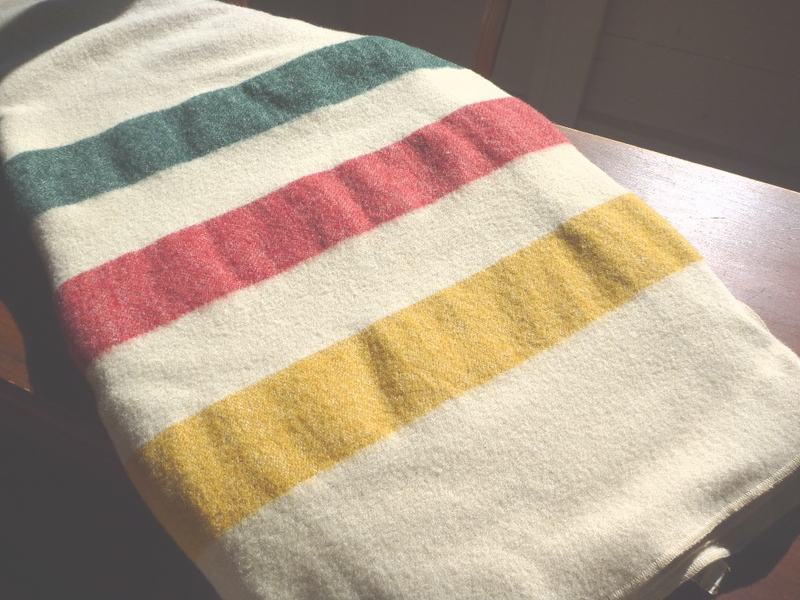 Coming off the tailored "wedding jacket" this was a refreshingly simple project. 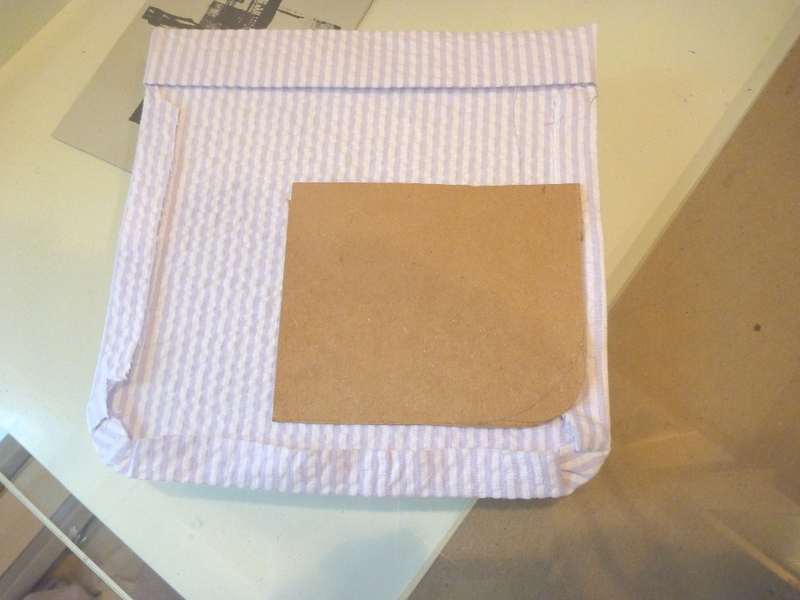 The curved patch pockets were pressed into shape using a template cut from an empty Cheez-its box. This pattern pre-dates fusible interfacings and calls for cambric. I have absolutely no idea what cambric is, so I interfaced the collar and facings with white cotton from a Goodwill king sized sheet. I've learned that thrift store sheets are an inexpensive source for muslins. My king sized sheet was only $2.99. 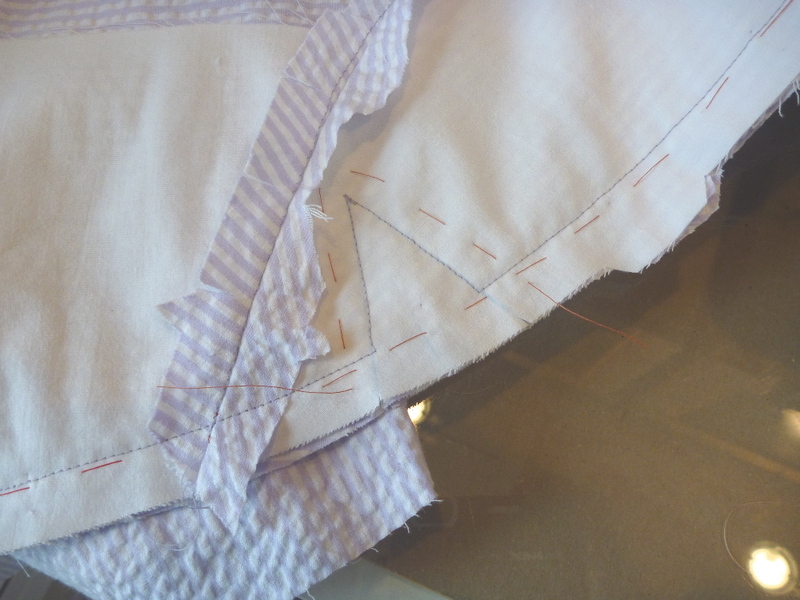 It was perfect for interfacing a summer robe. The notched collar was marked out with chalk on the interfaced collar. And here it is stitched. The notch is then slashed up to the point before turning the collar. 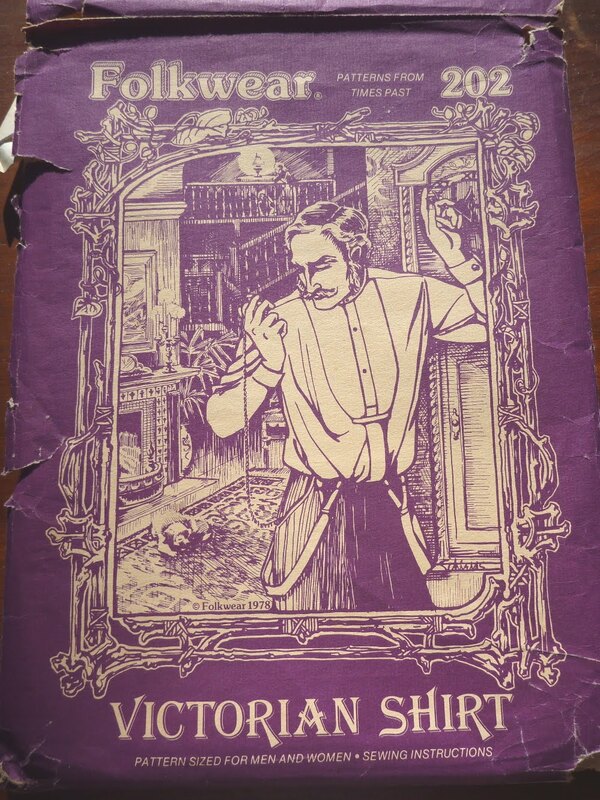 Unfortunately I don't have any pictures of the finished lavender robe. You'll have to trust me that the notched collar came out great. 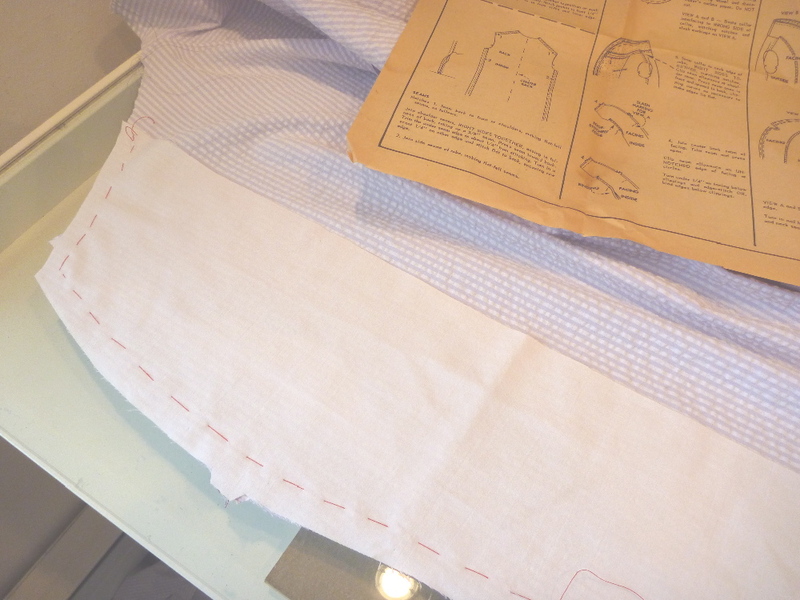 The pattern calls for all the seams to be flat felled. I did the felled seams at the shoulders but serged the rest of the seams. I sewed the bottom hem by machine and hand stitched the facings in place. 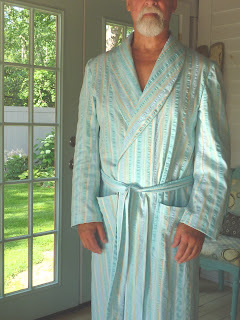 Then it was on to the aqua robe.